The kids got Muppet Whatnot Puppets this past year for Christmas and they are awesome! They come with interchangeable eyes, noses, and hair to make different Muppet characters. Our family loves the Muppets, so we decided this would be perfect for the kids and Justin has been really into puppets lately. So I wanted to make a puppet theatre, but I don’t have a lot of room to store something big. I looked online and found several door frame puppet theatres—but I knew that Justin wouldn’t like that and would end up not participating with us as a family. It took about 3 1/2 yards of fabric, two dowels, two large eyelets, iron on pellon, two flat wooden rods to reinforce the window, and wonder under for the bunting. Imagine all the fun fabrics you could make this out of?? We have collected so many hand puppets over the years, that we have a whole collection of characters to play with besides the Muppet Puppets. We have had so much fun with this, and we just roll it up and let it hang from the ceiling when we are not using it. I’ve already admitted that I am a Dr. Seuss fan, remember the Dr. Seuss pillow beds?? So you can probably guess how excited I am for Dr. Seuss day this Friday and the new Dr. Seuss film, The Lorax! Oh yeah, we are all dressing up on Friday! I don’t think we’re going to be adventurous and take the kids to the theatre on Friday. 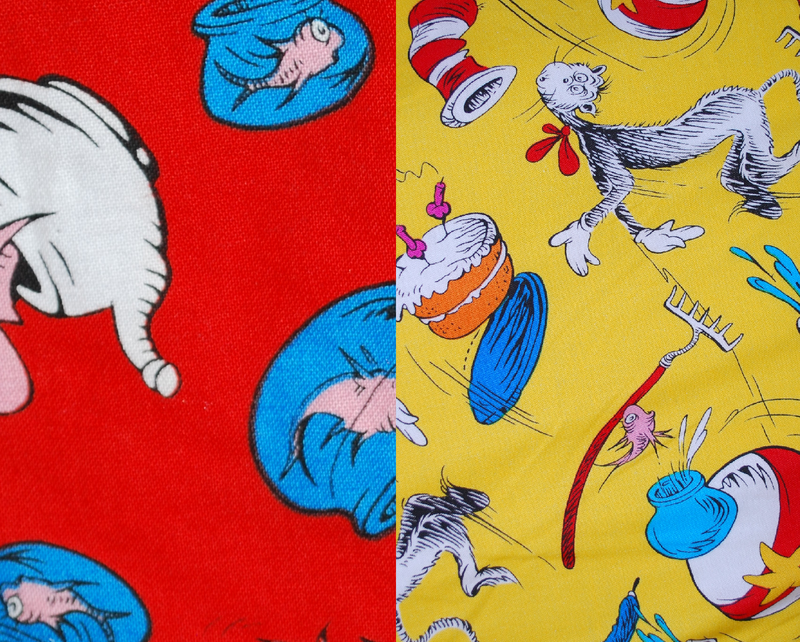 I think we’ll just party at home with a Seuss movie, fun Seussy treats and of course–the Dr. Seuss pillow beds!! Can’t wait!! My little guy turned two this year—so hard to believe!! And I really wanted to throw him a Sesame Street party because he is just starting to talk and he loves Sesame Street and Elmo. Those were some of his first words, so we were going to celebrate!! We invited just a few friends from church who are all the same age and planned on keeping it short to avoid my little guy’s afternoon crazy anti-nap mood. The Elmo cupcakes were a huge hit–and a huge mess, but the kids all looked so cute with their Elmo red moustaches! I used GFCF “Oreo” cookies cut in half for Elmo’s mouth, an orange skittle for his nose, and mini vegan chocolate chips for Elmo’s eyes. My parents were here for the party and they helped me decorate by using my Cricut to cut out shapes to make my paper lantern shades all look like Sesame Street characters—they turned out adorable! Here’s the tutorial for the pom poms at Nothing But Bonfires, they were huge and looked great over the kids’ table. I crumpled up bright colored tissue paper and dumped it on the floor for the kids to pick up for Oscar’s Take out the Trash game and again, the kids thought it was great to clean up the pretty trash. We’ve been exposed to so many great sensory ideas through Justin’s therapy and so I filled a plastic tub with dry rice and hid plastic rubber ducks in it for Ernie’s Rubber Duckie Find. They had to reach in and find them and they were a little hesitant at first, but they all really liked it! It was so much fun to throw a party for him, and it was even more fun to see how the little 2 year olds interacted with each other. They were all pretty shy!! They had a great time though, and no one cried! It was a sweet little celebration for my Sesame Street boy! Justin turned nine years old this year and he has never had a birthday party with his friends. It just seemed like an impossible situation where I would be throwing a party for a child who didn’t like noisy, unpredictable situations and he would be miserable!! Instead, we’ve always had a fun, themed party with just our own family. When I was thinking of a good party theme for Justin this year, I finally came up with an Angry Birds party theme! He loves playing angry birds on his iPad! I searched on Pinterest and found some of the most amazing Angry Birds parties ideas! And then I came across this party from Simply Styled Home and how they did a life-sized version of Angry Birds. I showed it to my husband and we decided that this would be a perfect party for Justin, and then it hit us that we really could have a friends party this year because the life-sized game would be perfect—it’s outside, active, appropriate for spontaneous squeals of joy, and not based on verbal skills:) HOORAY!! So we invited Justin’s Cub Scout group. I have to give a small shout out to this amazing group… Justin has been in Cub Scouts for a year now and I cannot begin to tell you what a blessing that has been to our family. My son doesn’t attend school, and has a really difficult time attending church meetings—so we were shocked to find out that Justin LOVES scouts. It makes me tear up just thinking about it! It is his only typical peer interaction that has ever been successful. It is because of an inspired Cub Scoutmaster who invited my husband and me to introduce Justin to the troop and talk about Autism. And also due to the unconditional love of these wonderful boys who don’t get upset when Justin is having a bad day. Sometimes we consider a family outing a success on whether Justin just endured the event without having a meltdown, but not only did he endure it—he ENJOYED it!!!! Justin did change his own party plans and pulled up his own chair to the candy table to sit for his cupcake. But everyone just went with it and surrounded him and sang Happy Birthday, and it couldn’t have worked out better. So appropriate for him to be at the candy table which is one of his true loves! My husband and I had a blast planning this party, and I love getting into the details—I admit it!! But the whole reason I do it is because it’s an outlet for me and an expression of love to my family….and to my pleasant surprise, we were able to catch such a sweet moment on film memory card! Every year, at the end of fall, I sit and romanticize how I will have a completely home-made Christmas and we’ll all work hard diligently for weeks and have the glorious reward of the kids exchanging beautifully handmade gifts for each other and then Ma will serve hot soup from the fire and Pa will get out his fiddle and start playing…..yes, I dream of a Little House on the Prairie simple Christmas! It doesn’t turn out quite like my dream, but after my 12 hours nap on Christmas after I’ve caught up from my sleep exhaustion, I love that I’ve made something for my family members with my own little hands. So I saw these pillow beds from No Rest for the Creative, on Pinterest and I really wanted to make them for my kids. We have just recently reached a point in our family, with the different ages of our kids and with my son’s Autism, that we can all watch a movie together with minimal drama or escaping children. I knew the beds would be another enticement to “sit tight” (as my dad would say) with the family throughout movie time. I loved the way they turned out, and it was a fun surprise for the kids on Christmas morning! We’ve had fun watching movies on them and they really are super comfy! My mom and I have been quilting for years together, and we both love Moda fabrics. And they come in these cute packs now called jelly rolls, layer cakes, honey buns, and charm packs that include all the fabrics in that line, all pre-cut and ready to create something fabulous. Love them! And it makes it so nice if you don’t live close to good quilting stores, because you can buy these “bake shop” goodies online and it eliminates fussing over trying to coordinate fabrics in a store. I found this sweet Redwork Renaissance charm pack at one of my favorite quilt stores, Material Girls. I saw a quilted bunting in the store and decided that a Valentine’s quilted bunting would be perfect for my fireplace. I stamped the letters for BE MINE with burnt umber acrylic paint and my Making Memories foam letter stampers. Then I cut out 3 hearts to use as spacers in between the words Be Mine and at the ends. I put a small layer of Warm and Natural batting between two pieces of fabric from the charm pack and then pinned them to my red and white twine. Then I sewed a square 1/4 inch from the edges, and sewed the hearts on to the spacer squares and it was ready to hang! I am just going to say it….this bunting is Sew Sweet! We went to the airport to catch our flight home after spending a few weeks with my parents, and like a weatherman predicts the weather, I was predicting by all accounts that the two flights home were going to be a breeze! Justin had been doing well in the airport and didn’t seem overstimulated by all the noise and chaos. So my parents and I took the kids and boarded with high hopes of having a successful flight home. Justin always sits in the same spot, by the window, in his car seat. So he pulls the shade down on the window, and just like in the movies, when darkness falls, something bad is about to happen. (Cue the suspenseful music) My dad and I sat next to Justin because we were on “Justin duty.” We both realized that as often as the weatherman’s predictions are wrong, so were ours on this flight turning out peacefully. For whatever reason, Justin decided my dad and I were not allowed to look at him, yes LOOK at him! So every time we did, he would reach over and move our chins back to looking forward and shriek at us. His shrieking got louder and louder and then he started kicking the seat in front of him and throwing his arms around–and people are still coming on the plane at this point. (Side note, once we are on the plane with Justin, he’s usually fine, it’s the airport waiting that is usually a problem. So again, why was my prediction so wrong?!?) So I trade places with my dad, not because I enjoy moving closer to danger, but out of primal instinct I was thinking “me-your-mother, me-can-do-anything, you-will-be-happy!” I tried all the normal tricks, and nothing was working. No amount of ABA, positive reinforcers meant anything to Justin at that moment. And so I moved on to Plan B, empty out every emergency trick from my carry on magic bag. He did not care one ounce about any of them and at the same time was escalating his kicking and screaming and pushing my chin to not look at him. I gave him his evening medications, which usually induce sleep, and figured even though it wasn’t quite night time, we could get him to sleep through this flight and the little hopper flight home. I was just praying we weren’t going to get kicked off the plane. Fifteen minutes later….no sign of the medications working, Justin is getting more and more mad and won’t take candy or any of the usual “sure-fire” tricks. Passengers are still loading in, and the guy in front of us pulls out some earplugs and puts them in his ears. This earplug thing irritated me. EARPLUGS??? REALLY??? Why on Earth didn’t I think of that!! Miss uber-prepared missed the idea completely! Because if I had thought of earplugs, I would have brought 15 pair and handed them out to everyone around us–oh what a great idea that was!!! So as things went from worse, to mommy-is-starting-to-lose-it-worse, I opted to try the emergency reserve of allergy medication. Here’s where the winning part of the story comes into play. Thirty minutes later we took off and Justin fell asleep. My dad and I took a breath of relief and I thought we were home free. And I was, for 2 hours. Then he woke up, and was still in a semi-foul mood. We landed at our layover airport, and waited 2 hours for our final leg home. He was still not in a good mood, but my parents are the ultimate optimists! My favorite line from my dad is, “I’ve climbed higher mountains, Shannon.” But I really didn’t think we were going to make it this time. Sure enough, as they called to board, Justin started screaming and running the other direction. So we let my mom fly home with my daughter, and my dad and I rented a car and we drove Justin home. And no, Justin didn’t sleep one wink in the car either! We rolled into my driveway at 2 am that evening and he stayed up another 2 hours before crashing at 4am. So I am not sure if we’ll be flying anytime soon, I think the superheroes in this story might hang up their costumes for awhile and just be regular civilians in our happy, regular routine. The man wants a cookie! We downloaded this great iPad app called Proloquo2go which allows us to choose icons that he likes and organize them so that he can choose what he wants and request it independently. There is an audio voice that speaks the name of the picture icon and so the iPad will speak the sentence Justin creates, like “I want-Sprite.” You can choose what kind of voice you want as the default so it can be male of female. We have a male voice programmed as the default and it is similar sounding in style to the Movie time listing male voice you get when you check the times on the phone. And if you are too young to know that movie times used to be checked on the phone, please don’t tell me! Anyway, this Proloquo app is AMAZING!! So I picked up Justin from therapy the other day, and on the way home I was daydreaming about all the things I needed to get done and all of a sudden this electronic “man voice” from the back seat says, “Cookie!…..Cookie-Cookie! I want….I want Cookie-cookie-cookie!” I could not stop laughing. What an amazing blessing this little iPad is to give my little cookie-monster Justin a voice and the ability to request his needs. So great! When Justin turned 8 we bought him an iPad. We had found out through his therapists that there were some great programs available to help non-verbal kids communicate. These programs are amazing!! We have seen a huge jump in Justin’s progress, and we’ve also been able to measure his progress better because he can answer questions now just by touching answers on the screen. I love living in the 21st century!! Justin’s sister is only 22 months younger than he is, and she has been a blessing to our family, and specifically Justin since she was born. She is always helping him and looking out for him and just loving him the way he is. It is incredibly moving as a parent to watch them interact, especially since Justin doesn’t talk. I just stood there for a second trying to reconcile how the word lucky and Justin could even coincide in the same sentence!! All I could think was, “are you kidding me?? Because not being able to talk and having Autism for the rest of his life somehow makes life lucky for him?? ?” But then I saw her sweet eyes, and she was only 6 years old, and always acting well beyond her years. So after I told her she could have a turn once in a while when he wasn’t using the iPad, I did share some of my thoughts—very watered down and with a “nice” mommy voice, and it was one of those priceless talks about life, trials, blessings, and why Heavenly Father loves us so much he put us together in families. I walked away chuckling though thinking about how someday I’d tell her about this conversation and we would laugh together. Nine years ago we were blessed with our first child. We had problems for 4 years trying to conceive, and so once our sweet boy was born, we spoiled him rotten! I wanted to document every second of his life, so I scrapbooked, and journaled, and took a million pictures and videos of him. Justin was full of sweetness, and loved to tease. He also was a big flirt, and with his big brown eyes he would bat his eyelashes at anyone he came across. We also had people stopping us in public to comment on what a little flirt he was! We moved away from home and family when he was a year old, and I was pregnant with my second child. I was put on bedrest, and as we stayed cooped up in our apartment all day I started to notice that Justin wasn’t acting like he used to. He was about 19 months old and I took him to the pediatrician and talked to him about his lack of speech. He told me this was all because he was a boy, and because he “sensed” a new sibling was coming. This was the beginning of many well-intentioned theories of why my boy didn’t have Autism that we went through for the following 2 years before we finally got an official diagnosis when right before Justin turned four. The diagnostic appointment, that we had to wait 6 months for because of how booked the Developmental Pediatrician was, went something like this: 15 minutes of playing with my child, turning on a tape-recorder so that I wouldn’t forget anything the Doctor said, and 60 seconds after he turned on the recorder he said the words I knew were coming, but I would have paid a million dollars for him not to say, “Justin has Autism.” He followed it up with saying that he only had a moderate form and with intensive therapy he could be mainstreamed by Kindergarten. It sounded promising when he said it like that, so my husband and I (after I wiped away my tears) said, “Great! Where do we sign up for this therapy, and when can we get started?” And as if getting the diagnosis of Autism wasn’t stomach wrenching enough, the Doctor answered, “It’s called ABA (Applied Behavioral Analysis) Therapy and it costs $50,000 per year and insurance doesn’t cover it. Good luck you guys!” And that was the end of the appointment. We drove to pick up my daughter from my friend who was watching her, and I cried on her shoulder, and then cried the rest of the night. The very next morning I got up and started making phone calls to see how we could get services for Justin. I won’t say I didn’t ever cry about Autism again, but once we finally had an answer after 2 years of trying to decide whether there was something wrong with Justin—the answer did help us move forward and start being proactive for him. We moved to a new state that had some services covered through government programs for Autism and we began the journey of ABA therapy, speech therapy, occupational therapy, and GFCF diets. My son is now 9 years old, and currently receives 30 hours of ABA therapy per week, and is doing well. There have been so many wonderful people who have come into our lives to bless Justin and our family. We found a wonderful Speech therapist here who diagnosed Justin with Speech Apraxia, secondary to Autism. And although we weren’t looking for any more diagnoses with Justin, again, knowing what he had helps us know how to help him best! Justin struggles to spontaneously talk to us, but when he does—the world stops and everyone cheers and it is always the sweetest moment of my day! I know that there are a lot of parents out there raising kids with Autism, and there are a lot of different degrees of Autism Spectrum Disorders, so I decided to use this blog to also share our story about Justin to reach out to those who need support, or just to provide a triumphant moment, or funny story about living with a child with Autism. I am not a big enough person to say that I am thankful for my trials, but I can say that I am very thankful for the lessons I learn from them, and a loving Father in Heaven who has comforted me and sustained me through the darkest of times. And Autism is at the top of that list! Justin is a blessing in our family that we couldn’t live without.